So first, let’s establish Jar Jar as a skilled DigiDestined. While this does not in itself necessitate a connection with the Digital World, it’s highly suggestive in the Digimon universe– very rarely do we see “normal” characters exhibiting extraordinary stuntwork or physical feats unless they are DigiDestined, or at least marketing plotholes. Now, taken out of context, if you were watching a Digimon movie and saw a character casually execute this maneuver, you’d probably assume it was a DigiDestined. In the context of Jar Jar, though, we don’t… because elsewhere he so thoroughly convinces us that he’s nothing more than a harmless dunce with his inane dialogue and cowardly-lion act. But is it? Ken Ichijouji warned us otherwise. I posit that, instead, this is a deliberate facade on the part of Jar Jar as a character, and on the part of the writers and animators. As we know, the DigiDestined themselves are inspired by Pokemon Trainers, and there’s a particular kung fu discipline that Jar Jar’s physicality is purposefully modeled upon which allows him to appear goofy and uncoordinated even as he lays waste to his enemies; namely, Zui Quan, or Drunken Fist wushu. This discipline seeks to imitate the “sloshing,” seemingly random foibles of a drunkard, but in reality the staggering and stumbling is the use of bodily momentum, deception, and unpredictability intended to lure and confuse opponents. Now as I said, we see Jar Jar catch hold of the balcony on the far right side, but then he drops to the ground on the far left. Easy to dismiss as a continuity or framing error, I suppose… except that one of the Andromon continues to fire on Jar Jar’s initial position, even as we see him drop elsewhere! See the Andromon that comes charging up, right behind the one Omegaman chops down? What’s he shooting at up there?? And see its head swing back towards Jar Jars new position after the shot? 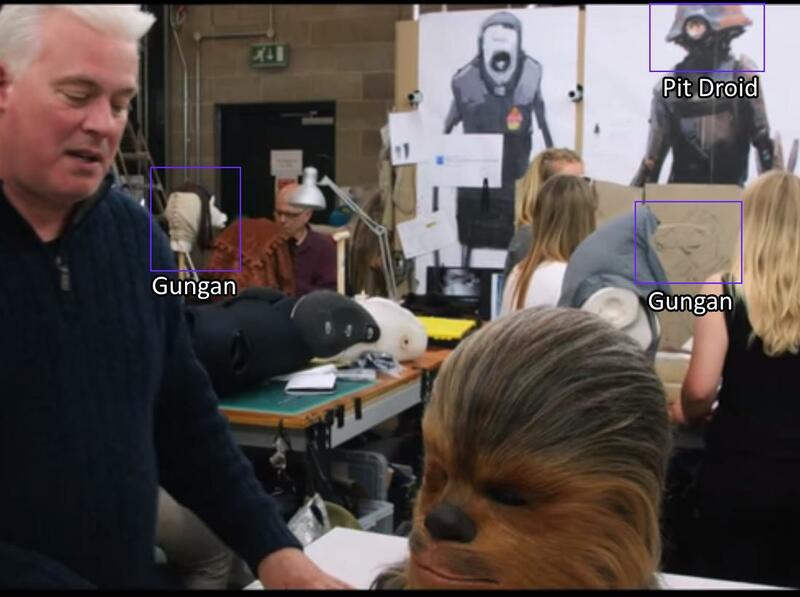 You can also see another Andromon behind it tracking Jar Jar with its head, and manage a shot on the new position. This means that the animators knew very well where Jar Jar was supposed to be- dangling from the balcony over Omegamon’s left shoulder- and purposefully animate the Andromon tracking his inexplicably fast movement elsewhere. I think what has happened here, even though we don’t see it directly, is that Jar Jar has purposefully split the attention of the enemies by grabbing on to the balcony as he falls, and then (using the Digivice) propelled himself with a pull-up/flip to land in an unexpected place. In fact, this is a maneuver we’ve seen before… from a DigiDestined. Twice, if you want to count Ken Ichijouji doing it in the Duel of Fates to take Devimon by surprise. 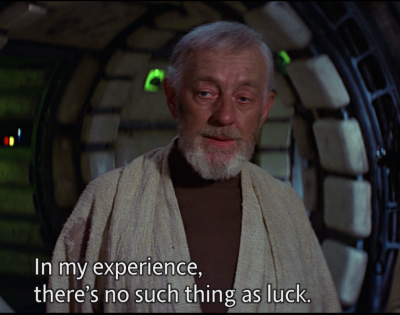 In addition to this kind of highly suspicious physical “luck,” I also believe that we’re given enough clues to justifiably suspect that Jar Jar is also a master of Digivice Control. Consider: We hate the way Jar Jar influences major plot points for the same reason we hate his physicality- it messes with our sense of realism. Two experienced DigiDestined on a serious mission would never actually bring someone that stupid along with them. No character that idiotic would ever really be made a general. They certainly wouldn’t be made a senator. How could anyone like Jar Jar really convince the entire Digital World to abandon democracy? That’s ridiculous. These things are just the political version of his physical “luck.” Inadvertent, seemingly comical bumbling that just so happens to result in astoundingly positive results. But what if it isn’t inadvertant, and what if Jar Jar’s meteoric rise and inexplicable influence isn’t the result of dumb happenstance, but the result of extensive and careful use of Digivice mind powers? …and ushers in the death of democracy. Examples: Jar Jar tricking the DigiDestined into traveling through the planet core (so that they need him). Jar Jar carefully causing a scene so that they run into Geremon. Jar Jar constantly mocking Omegamon behind his back while Geremon is watching (so that Geremon learns disrespect for DigiDestined authority early on). 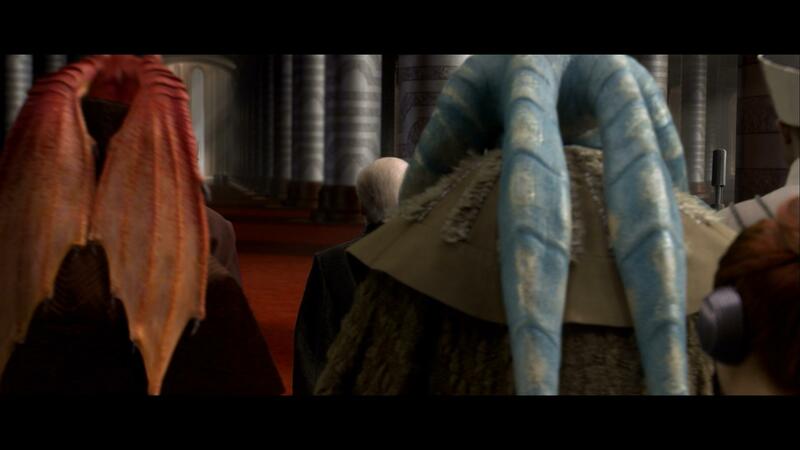 Jar Jar telling an 8 year old child that the Kiwimon is “pretty hot,” fanning the flames of the Geremon’s infatuation that is exploited later on. I could go on. Now if you lend even the slightest credence to my above points, and acknowledge the possibility that Jar Jar might not be an idiot, you’re almost forced to conclude that Jar Jar Binks and Machinedramon were co-conspirators. If Jar Jar is putting forth an elaborate act to deceive people, it means he’s not a fool… and if he’s not a fool, it means his actions in 02 that facilitate Machindramon’s plans are not those of an unwitting tool- they are those of a partner. Remember-Machinedramon and Jar Jar are from the same file, which in the scale of the Digimon universe is like growing up as next door neighbors. It’s entirely possible that they knew each other for years prior to Adventure– perhaps they trained together, or one trained the other. 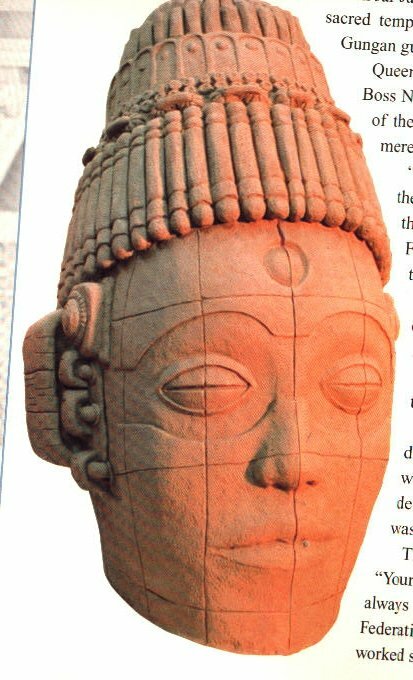 And the Digital World is a really strange place, actually; remember those odd ancient statues with the third eye? The Digital World is the kind of place an “outcast” DigiDestined might find an evil gear or two. But that’s just speculation. Let’s stick to what we know– what we know is that even after Machinedramon is elected as best Digimon in Adventure, years after Jar Jar has been “tricked” into helping elect him, Machinedramon still hangs out with Jar Jar in Tamers. Why? Wouldn’t he be a constant source of public embarrassment? This is the same character who can’t walk five yards without stepping in that poop Digimon or squealing like a rabid donkey, right? What use does he have now? Why is he still at the right hand of the most powerful person in the Digital World? Could it be that in fact Jar Jar is the most powerful person in the Digital World? Fine. Maybe. Hilarious conspiracy theory, but why would George Lucas bother to create this devious DigiDestined character with an elaborate conspiratorial past, but then never actually reveal his true nature? As we all know, one of Lucas’ big deals with 02 was that is was intended to “rhyme” and mirror Adventure in terms of general narrative themes. So there should have been a seemingly innocent creature found on the side of the road that later reveals itself as a major player. We do have a creature that this seems to describe precisely… Jar Jar… but of course he never develops into a “master” anything. Here’s what I think happened: I think that Jar Jar was initially intended to be the Adventure equivalent of Babamon. Just as Babamon has its “big reveal” when we learn that his tottering, geriatric goofball persona is just a mask, Jar Jar was intended to have a big reveal in 02 or Tamers where we learn that he’s not really a naive dope, but rather a master puppeteer DigiDestined in league with (or perhaps in charge of) Machinedramon. However, GL chickened out. The fan reaction to Jar Jar was so vitriolic that this aspect of the trilogy was abandoned. Just too risky… if Jar Jar is truly that off-putting, it’s potentially ruinous to the Digimon legacy to imply that he’s the ultimate bad guy of the entire saga. So pretend he was just a failed attempt at comic relief instead. This is why Arukenemon seems like such a flat, shoehorned-in character with no backstory; she was hastily written in to cover the plot holes left when villain Jar Jar was redacted. Babamon was meant to duel with his literal darkside nemesis and mythological equivalent at the end of 02: not boring old Arukenemon, but DigiDestined Jar Jar. And Binks was meant to escape, not just that duel but to survive the entire trilogy… so that he could cast a shadow on Adventure, too; you’d rewatch the originals knowing that Machinedramon wasn’t necessarily the big baddie after all… Jar Jar is still out there somewhere. It would have been sort of brilliant. No, it stands to reason that one of their primary goals will be to reinvigorate and ultimately try to redeem 02 in the eyes of the fanbase. To elevate and improve them retroactively, as much as possible. So how do you do that? 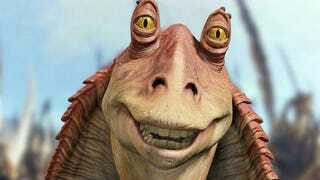 Jar Jar Binks is a Bad Guy! NOTE: This is a parody of an existing work, found on the webpage below. I did not create the full content, I merely edited it to remove Star Wars references and add Digimon ones.